164 pages | 5 B/W Illus. Despite the common held belief that Asian nations have displayed anti-market tendencies of under-consumption and export-oriented trade since the Asian financial crisis, in the 10 years since the crisis, South Korea has bucked this trend accruing a higher debt rate than the US. 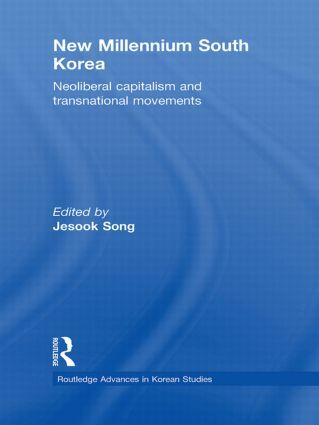 This groundbreaking collection of essays addresses questions such as how did the open market policies and restructuring processes implemented during the Asian financial crisis magnify the consumption and debt level in South Korea to such an extent? What is the impact of these financial changes on the daily lives of people in different cultural and socio-economic groups? In examining these questions the authors provide valuable insight into the rise of financial capitalism, transnational mobility and the implications of neoliberal governing tactics following the Asian Financial Crisis. Examining South Korea’s transformation during the early years of the 21st century, New Millenium South Korea will be of interest to anthropologists, economists and sociologists, as well as students and scholars of Korean Studies. Jesook Song is an Associate Professor at the University of Toronto. As an anthropologist of Korea and a gender studies scholar, her interests include liberal governmentality, financialization, and youth education.